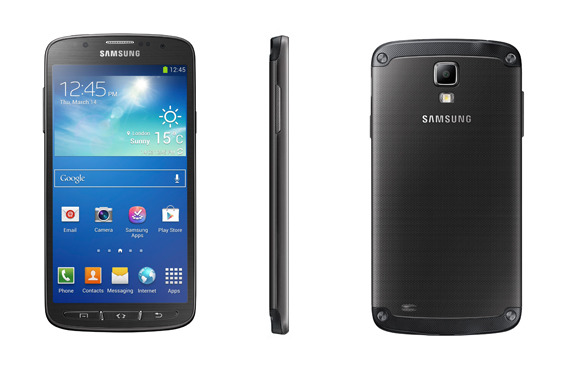 Samsung is adding another Galaxy S4 smartphone to its portfolio. The Active model is dust- and water-resistant, and has a special camera mode for underwater pictures and video. Last week the company also added the cheaper Galaxy S4 mini to its range. The Active is meant for people that want a more robust smartphone. The device has protection from dust and water, so it can survive a day at the beach or dusty hike, according to Samsung. The sealed design protects against water damage for up to 30 minutes in water at a depth of one meter, which what the Sony Xperia Z can handle. However, the Active has better dust protection. To take advantage of the water protection, Samsung has developed the Aqua camera mode, which is supposed to let the 8-megapixel camera shoot better pictures and videos when under water. The volume key located on the side can be used as a camera button. The resolution compares to the standard model’s 13-megapixels. Sealing the design has made the Active bigger and heavier. The Galaxy S4 Active weighs 151 grams compared to the original’s 130 grams and it is also 1.2 millimeters thicker. Other hardware specs include a 5-inch full HD screen, a quad-core 1.9GHz processor and LTE. On the software side, the Android 4.2.2-based Active has inherited features like “Drama Shot”, “Sound & Shot” and “Samsung Smart Pause”. The Galaxy S4 Active will be available for purchase beginning this summer, with initial availability in the U.S. and Sweden, according to Samsung. It will be offered in grey, blue and orange. Samsung didn’t say what the phone will cost.